Forecast: Lead Star takes a realistic drop in class in his first start in more than two months, returns to dirt, and shortens to an extended sprint. His only prior one-turn effort (in his debut at Del Mar last August) was fairly decent, so if given the patient ride he prefers the son of Union Rags looks more than capable of producing the last run. In a small field that should insure a trouble-free trip, he’s a straight play and rolling exotic single at or near his morning line of 3-1. Forecast: Speakers had a nightmarish trip when third in a similar spot last month. Blocked from the quarter pole home and unable to mount any sort of rally, the daughter of Unusual Heat still managed to wind up third while probably best. With better luck today and with Prat riding her back, she seems capable of returning to winning form. The one to fear most is Mongolian Window, who was overmatched in a much tougher allowance race last time out after being cooked on a hot pace and then fading in the lane. At this level, the Miller-trained filly, with several prior speed figures that are good enough to win, could easily bounce back in a big way. We’ll give Speakers a very slight edge on top while including both in rolling exotic play. Forecast: ​Mistressofthenight and Majestic Diva know each other well and meet again in this $16,000 middle distance main track affair for fillies and mares. ‘Diva nosed out ‘Night when they met in mid-December at Los Alamitos and both should be in the fray again today. Mistressofthenight has two prior wins over the Santa Anita main track and retains Rosario, but we must caution that she’s failed as the favorite in her last pair and may not be one to trust. We’re expecting the winner to be one of these two, so we’ll double the race in our rolling exotics but otherwise pass the race. 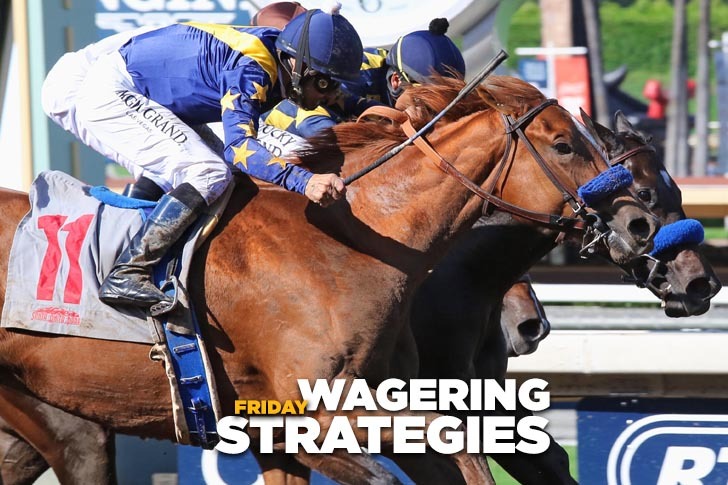 Forecast: Magical Gray finished an excellent second when last seen in a Del Mar turf sprint in November and returns to competition today for Garcia sporting a steady but unspectacular work tab. Let’s assume she returns at least as well as she left, and if so the daughter of The Factor should be tough to beat. She finished a sharp second in her only prior Hillside turf course. Storming Lady lands the comfortable outside post in her first start since being claimed for $50,000 by Marquez. Third two races back in the same race Magical Gray exits, she’s a seven-race maiden and has failed as the choice in four straight outings. Maybe she can improve for her new connections, so we’ll include her in a ticket or two in our rolling exotics. Forecast: Lieutenant Dan destroyed a maiden field by eight widening lengths last month and tries winners and two-turns today while trying to duplicate that performance. We can’t really say that he’s bred to improve routing, but as a son of Grazen he should be able to cope with a mile. On pure numbers he’s a standout. Our Silver Oak disappointed in the Cal Cup Turf Sprint but returns to dirt today and has two stakes placings on the main track when facing better company than he sees today. He’s not quite as fast on numbers as his main rival, so we’ll use him on a few tickets while reserving the main punch for Lieutenant Dan. Forecast: ​Offshore was much the best beating restricted $25,000 foes over this course and distance earlier this meeting, and if he can turn in two alike he should be tough right back. The Exchange Rate gelding retains Prat, draws the good rail, and with some help up front should produce the last run. Encumbered is an ex-classer who couldn’t handle a sloppy main track last time out, but his best efforts on grass makes him a strong contender. The returns to his claim level today is a positive factor. Wilshire Dude beat a softer field in game style on dirt last month but has run reasonably well on grass in the past, so the surface switch won’t bother him. The Spawr-trained gelding likes the front end and could get brave if not pressured early. Forecast: Spokane Eagle is vastly improved and seeks his fourth straight score after a highly-rated win in his first start last month since joining the Miller barn. Drawn comfortably outside and getting a break in the weights with the switch to Figueroa, the son of Speightstown looks primed to extend his streak. Edwards Going Left was a tad disappointing when he could manage only a third-place finish in the Cal Cup Sprint last month. But he’s always preferred this seven-furlong trip and with this return to the allowance ranks the son of Midnight Lute could easily regain his best form. Ax Man has been quite disappointing of late after such a promising start to his career last year. He continues to impress in the morning, so we’ll use him on a ticket or two, but not with a great deal of confidence. Forecast: Mobou is drawn farther out than we’d prefer but the son of Uncle Mo should be good enough to graduate in this one-mile turf affair restricted to California-bred 3-year-olds. We envision a good stalking trip in a race without any real effective closers. Posterize has the classic two-sprints-and-a-stretch-out pattern and a cozy inside draw, so the son of Shackleford seems certain to draft into a nice ground-saving position. We’re not sure if he really wants to route, but these types always seem to run well the first time two-turning, at least. We’ll use both in our rolling exotics and then press with Mobou on top.